The latest issue of The Great Outdoors is out now. In it there are reviews of three-season boots for men and women by me and Judy Armstrong. I also try the Primus PrimeTech stove unit; look at the history of Polartec fleece; and review John D.Burns excellent book The Last Hillwalker. 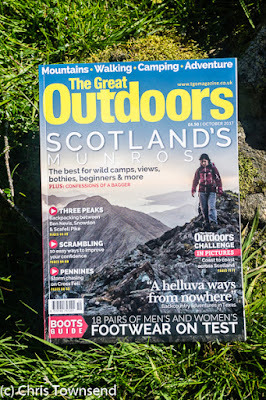 This issue has details of the 2018 TGO Challenge along with pictures from this year's event. Staying with the Highlands Robert Wight celebrates the Munros after completing them and Jim Perrin argues the case for Sgurr nan Gillean being the finest British mountain. Drew Collins starts in the Highlands too with Ben Nevis but then walks south to Scafell Pike and Snowdon, much the best way to do the Three Peaks. English and Welsh hills turn up again with Vivienne Crow describing a four-day circular walk in the Yorkshire Dales; David Lintern traversing the Carneddau; and Nick Hunt looking for the Helm Wind on Cross Fell. Far from Britain and British weather Ian R. Mitchell describes the rugged landscapes of West Texas, a fascinating sounding region. The Hill Skills section is a guide to scrambling by Carl McKeating, co-author of the updated Scrambles in Snowdonia from Cicerone. Also in this issue Hannah Lindon interviews Kerran Traynor and Graham Donald about their upcoming swim across Scotland; and Roger Smith looks at how legislation meant to protect wild places is failing and reviews Peter Fiennes interesting-sounding Oak and Ash and Thorn. Oops! Thanks for pointing that out. Correction made. Finishing stuff for the November issue now and thinking about December - I thought October was long gone!